Just look at a map of Remote Oceania – the region of the Pacific that contains Hawaii, New Zealand, Samoa, French Polynesia and Micronesia – and it’s hard not to wonder how people originally settled on these islands. They’re mostly small and located many hundreds to thousands of kilometers away from any large landmass as well as from each other. As our species colonized just about every region of the planet, these islands seem to be the last places our distant ancestors reached. A comprehensive body of archaeological, linguistic, anthropological and genetic evidence suggests that people started settling there about 3,400 years before present (BP). While we have a relatively clear picture of when many of the major island groups were colonized, there is still considerable debate as to precisely where these settlers originated and the strategies and trajectories they used as they voyaged. 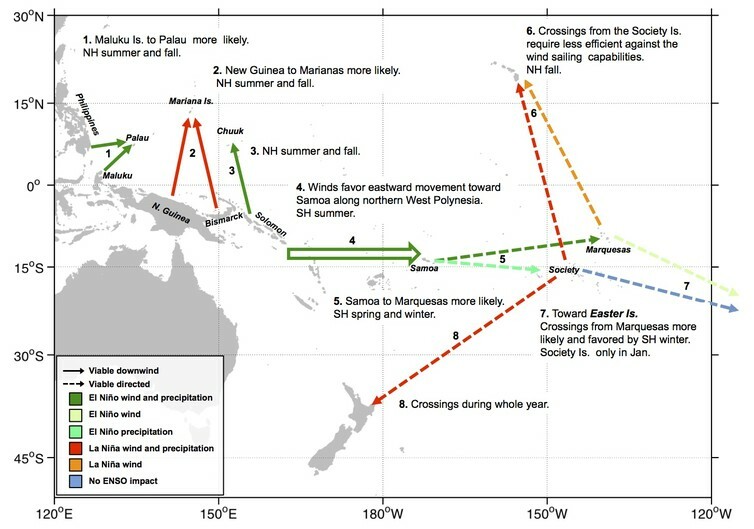 In new experiments, my colleagues and I investigated how environmental variability and Oceania’s geographical setting would have influenced the colonization process. We built computer seafaring simulations and analyzed wind, precipitation and land distribution data over this region of the Pacific. We wanted to understand how seasonal and climate variability in weather and currents might lead to some potential routes being favored over others. How would these factors, including the periodic El Niño and La Niña patterns, affect even the feasibility of different sailing strategies? Did they play a role in the puzzling 2,000-year pause we see in eastward expansion? Could they have provided incentives to migration? While the archaeological record contains no concrete information on the sailing capabilities of these early voyagers, their navigational prowess is undeniable. Settlement required trips across thousands of kilometers of open ocean toward very small targets. Traditional Pacific vessels such as double-hulled voyaging canoes and outrigger canoes would be able to make these potentially harrowing journeys, but at this point we have no way of knowing what kind of boat technology those early settlers used. 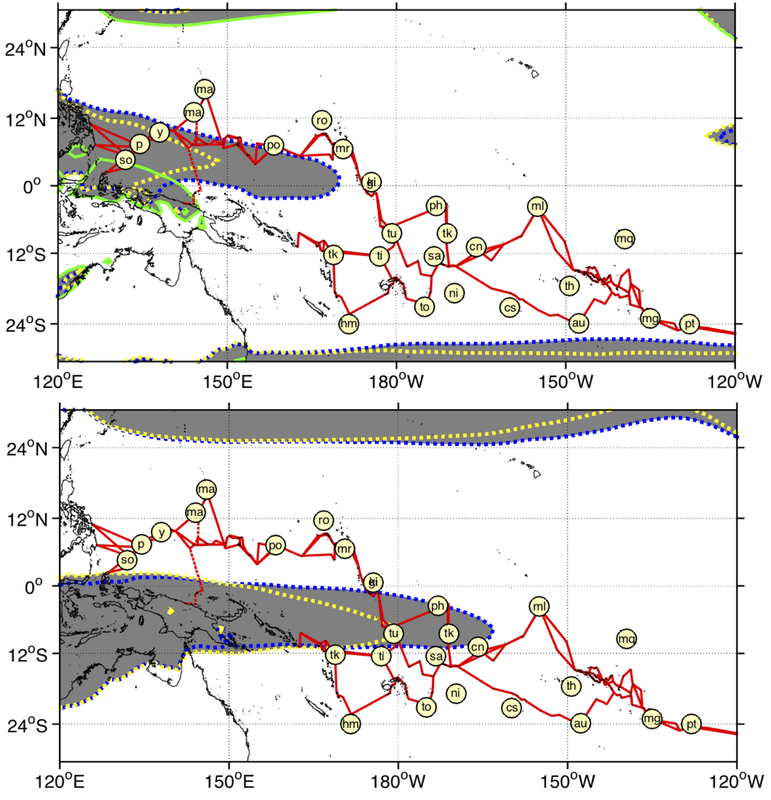 And colonization occurred in the opposite direction of mean winds and currents, which in this area of the Pacific flow on average from east to west. Scientists think the pioneers came from west to east, with western Melanesia and eastern Maritime Southeast Asia being the most likely source areas. But there’s still considerable debate as to exactly where these settlers came from, where they traveled and how. Among the many intriguing aspects of the colonization process is the fact that it occurred in two rapid bursts separated by an almost 2,000-year-long hiatus. Starting around 3,400 BP, the region between the source areas and the islands of Samoa and Tonga was mostly occupied over a period of about 300 years. Then there was a pause in expansion; regions farther to the east such as Hawaii, Rapa Nui and Tahiti were only colonized sometime between about 1,100 and 800 BP. New Zealand, to the west of Samoa and Tonga but located far to the south, was occupied during this second expansion period. What might have caused that millennia-long lag? 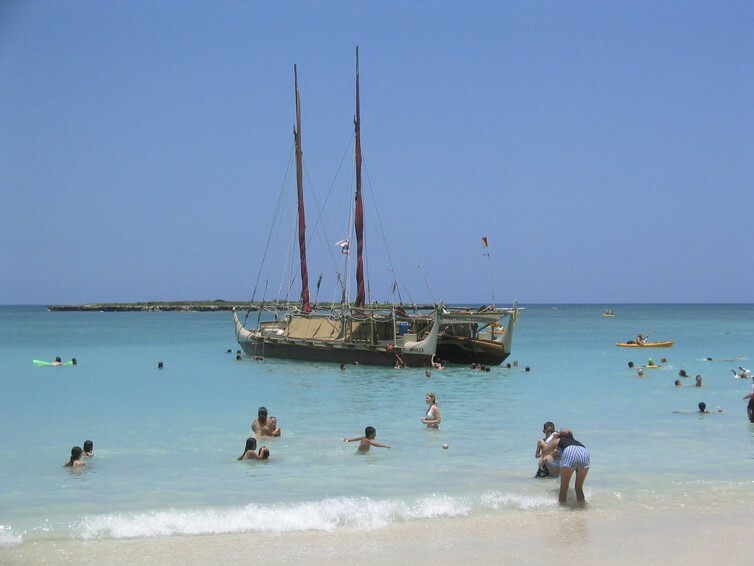 Contemporary replica of a waʻa kaulua, a Polynesian double-hulled voyaging canoe. Credit: Shihmei Barger 舒詩玫. The goal of our simulations was to take into account what we know about the real-world sailing conditions these intrepid settlers would have encountered at the time they were setting out. We know the general sailing performance of traditional Polynesian vessels – how fast these boats move given a particular wind speed and direction. We ran the simulation using observed present-day wind and current data – our assumption was that today’s conditions would be very close to those from 3,000 years ago and offer a better representation of variability than paleoclimate models. The simulations compute how far one of these boats would have traveled daily based on winds and currents. We simulated departures from several different areas and at different times of year. First we considered what would happen if the boats were sailing downwind; the vessels have no specified destination and are allowed to sail only in the direction in which the wind is blowing. Then we ran directed sailing experiments; in these, the boats are still influenced by currents and winds, but are forced to move a minimum daily distance, no matter the environmental conditions, toward a predetermined target. We still don’t know what type of vessels were used or how the sailors navigated; we just ran the model assuming they had some way to voyage against the wind, whether via sails or paddling. One goal of our analysis was to describe how variations in winds and precipitation associated with the annual seasons and with the El Niño and La Niña weather patterns could have affected voyaging. We focused on conditions that would have favored or motivated movement from west to east, opposite to the mean winds, but in the general direction of the real migratory flow. We also used land distribution data to determine “shortest hop” trajectories. These are the routes that would be formed if eastward displacement took place by a sequence of crossings in which each individual crossing always reaches the closest island to the east of the departure island. What did the environmental data suggest? After conducting thousands of voyaging simulations and calculating hundreds of shortest-hop trajectories, patterns started to emerge. While the annually averaged winds in the region are to the west, there is significant variability, and eastward winds blow quite frequently in some seasons. The occurrence and intensity of these eastward winds increase during El Niño years. So downwind sailing, especially if conducted during particular times of the year (June-November in areas north of the equator and December-February in the Southern Hemisphere), can be an effective way to move eastward. It could be used to reach islands in the region of the first colonization pulse. Trips by downwind sailing become even more feasible under El Niño conditions. Our shortest-hop analysis points to two “gateway islands” – eastward expansion into large areas of Oceania would require passage through them. Movement into Micronesia would have to go through Yap. Expansion into eastern Polynesia would mean traveling through Samoa. This idea of gateway islands that would have to be colonized first opens new possibilities for understanding the process of settling Oceania. As for that 2,000-year-long pause in migration, our simulation provided us with a few ideas about that, too. The area near Samoa is marked by an increase in distance between islands. And no matter what time of year, El Niño or not, you need to move against the wind to travel eastward around Samoa. So it makes sense that the pause in the colonization process was related to the development of technological advances that would allow more efficient against-the-wind sailing. And finally, we think our analysis suggests some incentives to migration, too. In addition to changes to wind patterns that facilitate movement to the east, the El Niño weather pattern also causes drier conditions over western portions of Micronesia and Polynesia every two to seven years. It’s possible to imagine El Niño leading to tougher conditions, such as crop-damaging drought. El Niño weather could simultaneously have provided a reason to want to strike out for greener pastures and a means for eastward exploration and colonization. On the flip side, changes in winds and precipitation associated with La Niña could have encouraged migration to Hawaii and New Zealand. Overall, our results lend weight to various existing theories. El Niño and La Niña have been proposed as potential migration influences before, but we’ve provided a much more detailed view in both space and time of how this could have taken place. Our simulations strengthen the case for a lack of technology being the cause for the pause in migration, and downwind sailing as a viable strategy for the first colonization pulse 3,400 BP. In the future, we hope to create new models – turning to time-series of environmental data instead of the statistical descriptions we used this time – to see if they produce similar results. We also want to develop experiments that would evaluate sailing strategies not in the context of discovery and colonization but of exchange networks. Are the islands along “easier” pathways between distant points also places where the archaeology shows a diverse set of artifacts from different regions? There’s still plenty to figure out about how people originally undertook these amazing voyages of exploration and expansion.